Eurocom Corporation (www.Eurocom.com) is now supporting the Hitachi Travel Star 5K1000 1 terabyte, SATA III(6Gb/s) Hard Disk Drive in its line of high performance notebooks. Hitachi Travel Star 5K1000 mobile hard drives are perfect for use within Eurocom’s line of High Performance Mobile Workstations and Performance Business and Gaming Notebooks where user’s demand increasingly large storage capacity and blazing speed. Eurocom Mobile Workstations and Mobile Servers are built to offer unmatched performance, long lifespan and full upgradeability of the processor, memory, storage, operating system and VGA technology, and are designed with the most innovative technology and components available, from workstation class desktop Xeon processors and RAID support to dual GPU capabilities. “At Eurocom, our customers are extremely excited to have the opportunity to have a single 1 TB storage drive with SATA III speed. The Hitachi Travel Star 5K1000 drive will greatly improve our overall storage offerings, next to our Solid State, Hybrid, mSATA and Hard Disk storage options” says Mark Bialic, Eurocom President. The Hitachi Travel Star 5K1000 is the first 1 TB, 2.5 inch HDD with SATA III (6 Gb/s) interface. It utilizes Advanced Format technology to increase the capacity while improving error correction capabilities, it does this by using longer sectors that contain 4096 bytes, instead of 512 bytes. There are several advantages of this. Firstly, the drive uses less physical space to store the same amount of data, which results in an efficiency improvement. Secondly, a larger and more robust error correction code can be utilized, better protecting your data. 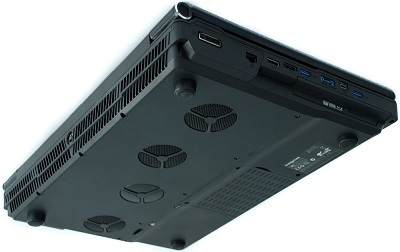 Eurocom offers RAID capability in several notebooks to improve data redundancy or performance. RAID stands for Redundant Array of Independent Disks, the ultimate goal of RAIDing ones drives is to provide increased levels of data reliability and backup as well as increased levels of read/write performance. Different levels of RAID correspond with varying levels of performance and redundancy; this is why Eurocom offers choices between RAID 0/1/5/10 in the Panther Mobile Workstation and other levels of RAID in the Neptune 2.0, Scorpius and Racer 2.0 notebooks. The EUROCOM Panther Mobile Workstation supports four storage drives to offer unmatched mobile storage capacity, of up to 4TB. The Panther has three standard storage drive bays; the fourth drive is housed in and takes the place of the optical drive bay. Eurocom offers customers the option of replacing the optical drive in their Eurocom notebook with a storage disk, to greatly improve storage capacity.